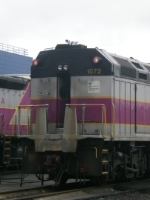 Description: 1072 poses in her new paint at Boston Engine Terminal. 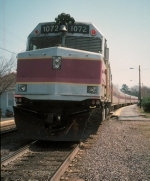 Description: MBTA 1072 is on the rear of an MBTA commuter train, passing the Pawtucket yard. Description: P515 to Framingham arrives at Wellesley Hills. Description: Plymouth-bound 063 speeds over Randolph St. Description: Outbound 041 speeds right over Pond St. as I stand pretty darn close to the thing that's going by at 70 mph. Description: Inbound 064 gets pushed into Boston by 1072. Description: F40 1072 is getting ready to pull Middleboro-bound 2007 out of South Station. Description: Locomotives 1072 and 1120 prepare to depart for Middleboro and Kingston. Description: 1072 sits with its consits in Southhampton St. yard. Description: F40 1072 roars through South Weymouth with outbound 065 headed for the station. Description: The lineup resting at BET. Description: Resting in the yard for the weekend.